After reading the following first trimester pregnancy books you will be up to speed on what’s happening to your body, how your baby is developing, ways to feel your best, grow a healthy baby and to decide where and with who you would like to give birth. Penny Simkin did it again with the newest edition of Pregnancy, Childbirth, and the Newborn! If every woman that ordered What to Expect When You’re Expecting “accidentally” received this book instead, I’m convinced the world would be a better place. Seriously! I believe that the family unit is the foundation of society, and unlike the afore mentioned book, Pregnancy, Childbirth, and the Newborn helps parents set themselves up for success! This might be my favorite general pregnancy informational book out there. The biggest reason I loved it so much is that there was a page for every day of my pregnancy. So often books will be organized by trimester, which always left me wanting more. I usually didn’t want to know what was going to happen in three months, I wanted to know what was happening RIGHT NOW. A lot can change in a whole trimester, so breaking it down day by day made so much sense to me. I love the fetal development updates, it gave me a way to visualize what was so hard to conceptualize from the outside. Love this book! If there’s one thing the first two general pregnancy information books above don’t do well, it’s focus on how to be healthy – truly healthy- before, during and after pregnancy. We all want to stay healthy, and have healthy children, so the focus of this book is extremely important. But don’t worry, this book won’t give you more mommy guilt. We already have enough of that on our own! This book is not condescending, but written in a way tat presents all angles and leaves you, the parent, to make the best decision for you and your family. If you are wanting to eat healthy, but not lose any flavor this book is for you. From herbed chicken to salmon to cookies to soups, you’re bound to find new, delicious foods that suit your pregnancy needs. The neat part about this book is that it will help you create variations in the recipe to suit your moods, nausea (boo morning sickness!) and cravings. Also, the book was written by a woman who has been pregnant before which really shines through in her book. Love it! When I had my first pregnancy appointment at the OBGYN I was handed a piece of paper about nutrition; things to eat and foods to avoid. There was no conversation, which was so sad to me. This book will definitely fill that gap. If women were taught the knowledge contained in Real Food for Pregnancy and given the resources to make it happen, our world would quite literally be a different place. Backed by well documented research, Nichols helps parents choose the best foods for a healthy pregnancy, natural birth, and happy postpartum. As a childbirth educator, doula, and pregnancy blogger, I’m thrilled to finally have a resource on pregnancy nutrition that I can endorse. 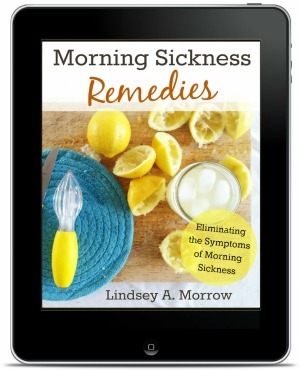 If you are struggling to find morning sickness remedies that work for you, look no further. These remedies bring you proven remedies both modern and alternative. Learn lifestyle adjustments that will bring you a better sense of well-being during pregnancy, and get the upper hand on morning sickness before you become pregnant. Learn herbal remedies, go in-depth with pharmaceuticals and much more. I own this book and I love it. The photos will knock your socks off. In fact, if I am doing a private childbirth class, I will bring this book to explain anatomy, to show weekly baby development and it even has great visuals on “how birth works”. If you are curious about what your baby looks like “right now” this book is for you. If you’re looking for a maternal narrative and a pep talk about pregnancy, buy another book. Bonus: The book comes with a DVD with really amazing animations of the mother baby unit. Want evidence based research to help you formulate your own ideas on birth and the medical options that accompany the process? This book is for you. Need the information in an easy to read narrative with the citations at the end of the book? You’re in business. You will learn something new by reading this book – guaranteed! Love, this book as it “awakens” the huntress in mamas. This book covers cesareans, breech babies, inducing labor, electronic fetal monitoring, rupturing membranes, coping with slow labor, pain medication, episiotomy, vaginal birth after a cesarean, doulas, deciding on a doctor or midwife. Because of its personal nature, it’s hard for me to pick out one pregnancy journal for you, someone I’ve never met. Check out this page for more ideas and options for pregnancy journals if the one below doesn’t seem like a good option for you. •It has a blue elastic band that wraps around the book ensuring it stays closed and secure. •It is broken down into three trimesters making it easy to organize and use. •This pregnancy journal stays lighthearted and fun with writing prompts like “Days I have been wearing sweatpants in a row:____”. So funny!